Summer vacations are expensive enough. They become even more so when thrown together at the last minute. We’ve learned that to stretch our money as far as it can go, we have to look early and often for deals on hotels, airfare, rental cars, and attractions. Then when a deal surfaces…POUNCE! Our summer vacation discussions begin in January. We throw out ideas and narrow the list to around five options. Then we begin researching various travel sites, always staying alert for deals that might coincide with our alternatives. So on Sunday, March 30th, my wife gets into a discussion at church with a friend who had just returned from a Celebrity cruise. In passing, he happened to mention that Royal Caribbean was doing a promotion where the third and fourth passenger in a stateroom sail for free. The catch…the deal ended on Monday, March 31st. We booked it that night. And by the time my wife got off the phone with the Royal Caribbean agent, they had found two connected junior suites that were actually running cheaper than the standard balcony rooms. So of course we took that “suite” deal for our family of six. We got all that because we were planning ahead and were ready to commit when the time was right. Planning for vacation is one thing. How to pay for it is another. A person could find the greatest deals in the world and still go into debt for vacation. In order to stay out of debt for summer vacation, it’s imperative to start saving early…crazy early in fact. For our trips this summer, we started saving in July 2013, when our last vacation for that summer was completed. Every month since last July, we’ve been putting money into our savings account earmarked for “Summer Vacation 2014.” We actually give that money a name (like a sub-account in our savings) so we can keep track of it. Identifying the money in this way also makes sure it doesn’t get used for something else. It’s not just money from our paychecks we save though. For starters, we had money left over from Summer Vacation 2013, so that simply rolled over into the account for this summer. We also save funds from work bonuses, tax refunds, monetary gifts and funds from selling personal items (ex. at a garage sale). Pretty much any time money rolls in from an unexpected source, we consider putting some of it towards our summer vacation budget. Using a system like this will help save money and build a solid fund for that summer vacation. Funny thing is, I’ve noticed paying with cash brings me more enjoyment of the actual trip. The best vacations it seems are the ones you return from debt free. Questions: How do you save for summer vacations? Do you pay with cash or use credit cards to pay for expenditures while on the trip? Do you agree the best summer vacations are ones you don’t have to pay for once you return? What destination(s) are you off to this summer? Some people like to choose vacation spots that are a short drive from home, while others like to take longer drives. Long drives can be more pleasant with proper planning. By proper planning, you can confirm that you save money and provide healthy food for your kids during your trip. You can make your own trail mix and even take snack bags of freshly cut raw veggies for the kids to eat along the way. We do both types of trips…short ones and long ones. Of course, the longer trips are more expensive and take us longer to save for. And we always take snacks on long trips to cut down on costs. Thanks for reading and the comment! I also love travelling especially the natural beauties. Though the these Falls are beautiful year-round, our enjoyment of the national park’s beauty could largely depend on when we actually visit. That is awesome that you are such great planners to save for your vacations. I also use sub-accounts on my online savings account for large purchases and annual payments (like life, home, and auto insurance). I don’t focus on saving specifically for our vacations because we travel a lot… and because all of our trips are paid for using airline miles and hotel points. The only travel expense we budget for is our annual dues for our timeshare. With the money we save traveling using miles and points, we are free to go on more vacations and not feel guilty when we splurge on a really cool item we want to bring home or a unique experience to create more memories with. Have fun with your travels! Where are you headed next? We do the sub-accounts for those insurance items as well, plus many other things. I find it really keeps me organized and prevents me from experiencing those “gotcha” moments that used to occur in my budget when I wasn’t prepared for an irregular expense. It sounds like your summer will be full of fun and good memories in the making! I love Niagara Falls! My DH and I were there last August due to his work and we stayed in a penthouse suite for 2 nights at the Niagara Fallsview Casino Resort on the Canadian side. The view to the falls was absolutely incredible and we didn’t pay a dime. I later found out that our room was $600/night! I really want to see the falls at night. I’ve seen pictures of how they light it up and it looks spectacular. Nice vacations! 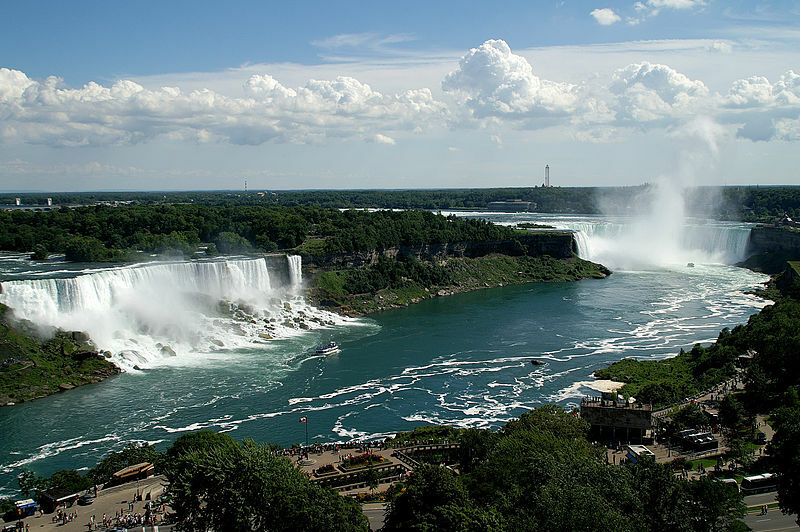 Niagara Falls is one of those awesome natural wonders that has to be seen to be believed. Plus there are some great locations within a short trip (I have a soft spot for Buffalo, and Toronto is a short couple hours away). We save up every month for a vacation fund, just so we’re able to pay for our vacations in cash like you guys do. Great minds! I’ve been to NF once and am looking forward to being there with my kids. Wasn’t able to do the Maid of the Mist boat trip last time, so we are definitely booking that this go around. I have a travel fund as well! I think it is a great idea. I usually pay for my vacations months in advance and use the money in my travel fund for spending money. Paying in advance can save a good deal of money. The further out you go the better the deals usually are. The cruise we booked months ago would now be about 1k more expensive if we booked now. I’ve been to Niagara Falls three times, and each time we drove there. I can’t imagine making the trip from Atlanta, though! I really like the idea of saving money on a monthly basis, and rolling the previous vacation fund into the next. Since we’re still paying back our student loans, we haven’t made vacations a priority. When we do, I think we’ll use this plan! It’s going to be along haul, no doubt. We are going to break it up by doing some activities along the way. Baseball game in Cincinnati, two days at Cedar Point, couple of days in Gatlinburg on the way home. I do the same thing! I ONLY pay cash for vacays (well, I don’t have a credit card so this is really my only option). Since my birthday is in May, I tend to get gifts that I use toward my trips, such as money towards the plane ticket or gift cards for eating out. Cash is the way to go! Cool! We don’t have a credit card either and are probably spending less because of that. Awesome that you’ll pay in cash! Good for you. I love that you save all year long for it- and the bonus is that you’re teaching your children great personal finance habits as well! “…save all year.” This is about the fourth year we’ve done this. It continues to amaze me how easy paying for it ends up being when you plan for it all year round. Nice job! We do the exact same thing with out vacation fund. capital One 360 (used to be ING Direct) lets you open like 25 savings accounts with their own names, so when we need to save for a specific thing we just open a new one! That’s a great feature to offer. I simply track ours in Excel. We save a little bit of money out of each paycheck to pay down a bill all at once and for a vacation. We usually see what we have left and plan our vacation accordingly. I think it’s a great idea to have a special savings account earmarked for a vacation. I think I might start that since we really would like to go to Europe one day. Another thing it does that I didn’t mention is that it helps with motivation to save. Seeing the sub account grow gets you excited to save more so you can do more on the trip. A cruise for the family sounds like lots of fun! We have yet to take a cruise (I am concerned that I would get motion sickness), but I have wanted to try one because there are always activities for everyone. We have recently started planning more for our travels and creating vacation accounts. It really is a great way to get ahead, especially if you know you want to travel. For a first time cruise, I’d do a short weekend trip to the Bahamas. You don’t want to book a week long one and find out on day two you hate it. The motion issues aren’t that bad. During the day, the ship is either docked at port or cruising very slowly, so you don’t feel anything. At night is when they crank it up. It’s actually a soothing feeling for me and puts me right to sleep. I’ve only really felt the motion on one cruise when we encountered a bit of high surf. It’s a great vacation for the money, imo. Very cool Brian! We do something very similar. We just use our credit card and pay it off with the cash we’ve saved specifically for the trip. In terms of saving, having it in a separate account and the extra saving we do pretty much the same exact thing. We’re going to San Diego for a three week trip this summer as well as Fincon and will probably go to Chicago for a long weekend very early in the fall. You’ll love the Junior Suite on Royal Caribbean. We had one for our last cruise and loved it! We love RC…have done many cruises with them and thoroughly enjoyed the atmosphere. We’ve done balconies but never suites. We really lucked into that deal and are looking forward to it. I don’t necessarily always do summer trips, just trips when I can. The only two I have planned are Nola in Sept for Fincon, and Croatia next year, so they are spaced far apart enough so I can save a lot for them. I must admit the temptation to just say f it and book a trip somewhere is always there, especially when I’m stressed out, but paying for a vacation later instead of before would be much more stressful. Sounds like you scored some great deals. We sort of have to earmark our trips for the summer. Jan. – Apr. and Nov. – Dec. are pretty much shut down due to kid’s school and Kim’s work. No CPA is getting vacation time during tax season or end of year planning. Every time I travel, I dread pulling out either my credit card or my debit card. Either way the expenditure hurts a little. If I had a designated amount that would be spent it would be so much easier. I love the idea of a separate, sub savings account that is designated just for one thing. “…sub savings account that is designated just for one thing.” We actually do that for many things, not just vacations. House projects we are saving for, bills that come once or twice a year, school supplies…It’s revolutionized how I approach spending. True story: We drove from Canada to Florida three summers in a row when our kids were small. The first trip was a learning experience for the kids – being in the car for extended periods of time, sleeping in a motel each night of the journey, picking up food at the drive thru so we could keep on the road. Well after one trip, we were feeling particularly spent out and on the drive home we decided to economize. Before we pulled up to the McDonalds, we told the kids, we would be ordering for them because we were trying to save money after a lovely trip to Florida, so no Happy Meals, no drinks, no fries and no complaints. At that time you could get hamburgers for something like 39 cents. We ordered 12 hamburgers and 6 waters and then coasted home the final leg of the journey on fumes. We still laugh at that story with the kids. So I guess we did teach them some frugal at an early age! The great stories from road trips! I know parts of them can be long and tedious, especially with kids groaning in the back seat. But they are so much fun and provide great memories. We are certainly looking forward to ours.